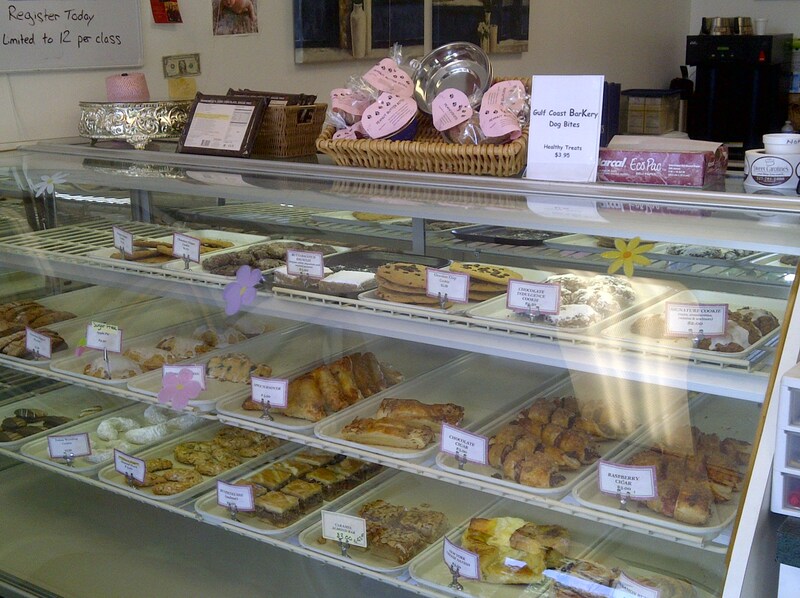 Sweet Caroline’s Bakery in Palm Harbor, Fla. Whether you live in Palm Harbor, Fla., or not, you need to go to Sweet Caroline’s! Sweet Caroline’s does everything from wedding cakes to bread, and it’s all amazing. In October, I traveled down to Palm Harbor for my future sister-in-law’s baby shower. This is the first baby of our family, so both soon-to-be grandmas and I had so much fun planning the shower —which of course included getting a cake! My Mom knows my desire to shop local, so she did some research and found Sweet Caroline’s. The entire experience from start to finish was great. 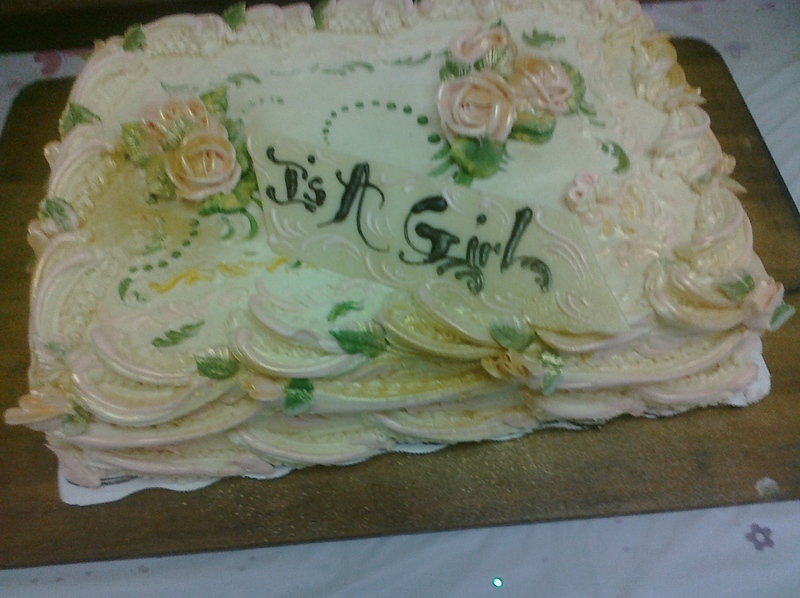 Not only was the cake delicious and gorgeous, the service was impeccable! Executive Pastry Chef Michael Ostrander worked with my Mom on the design, flavors and fillings. Chef Michael has more than 40 years of professional baking experience, and he truly cares about his customers. Plus he uses all natural ingredients! On the day of the shower, I couldn’t wait to see this cake. My Mom had really been talking this place up, so I had high expectations. Upon our arrival, the store smelled and looked amazing! Chef Michael personally came out to greet me and took me in the back to show me the cake! It was gorgeous! He cared so much that my mom was pleased with it that he asked me for permission to put gold spray on it. (He wanted to get my permission since my Mom hadn’t requested that). I figured gold makes everything better, so I gave him the okay. This was not your typical baby shower cake —it was a three-layer, chocolate-and-vanilla, raspberry-filled cake, topped with gold spray, and DELICIOUS!!! The baby shower cake made by Sweet Caroline’s Bakery. After our amazing experience with the cake, we ordered rolls from Sweet Caroline’s for our Thanksgiving dinner. These rolls were awesome. The first thing my Dad told me to do when I walked into our house in Palm Harbor was to eat a roll. Ha! Sweat Caroline’s also offers baking classes on Sundays. You can learn how to make everything from bread to pies to cupcakes. For a full class schedule and more information, visit the Sweet Caroline’s Bakery website. 3347 Tampa Rd., Palm Harbor, Fla.
Posted on November 30, 2011 by C.E. 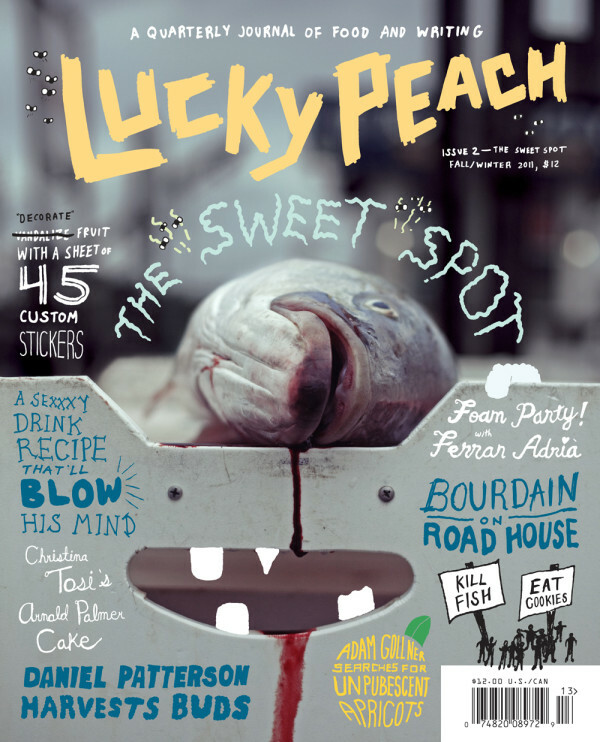 Lucky Peach Issue 2: The Sweet Spot features rot, apricots, flippant fruit stickers and, um, Anthony Bourdain. ∆ Are you still too stuffed from your Thanksgiving feast, and the leftovers that followed, to begin thinking about what you’re going to bake for all those festivities coming up in December? If so, I’ll make it easy — you can’t go wrong with cupcakes. For a selection of recipes that will work for whichever holidays you’ll be celebrating this season, check out these posts by some of the best bakers in the blogosphere: Cupcake Rehab’s favorite Christmas cupcakes, Bake & Destroy’s Vegan Sweet Potato Cupcakes, Modern Domestic’s Hanukkah Cupcakes and the Gluten-Free Goddess’ Frosted Orange Crème Cupcakes. ∆ McSweeney’s released the second issue of its quarterly journal of food and writing, Lucky Peach, this month. This is not your typical food magazine. Inside the Sweet Spot issue, you’ll find a lengthy Michael Ames piece about rot, Adam Leith Gollner’s story of his search for the world’s sweetest apricots, and several recipes from ultra-trendy dessert purveyor Momofuko Milk Bar, including a Burnt Miso Butterscotch Topping that looks kind of awesome. (New York chef David Chang, king of the Momofuku restaurant empire, partnered with McSweeney’s to create the magazine). Oh yeah, and everyone’s favorite celebrity chef, Anthony Bourdain, contributes a piece about a conspiracy involving the movie “Road House.” (Where isn’t Bourdain popping up these days?) Best of all, there’s a sheet of 45 fruit stickers with slogans and illustrations that would make Miss Chiquita Banana blush. ∆ Audrey Robbins, owner of Pan-Handlers Kitchen Supply, just announced that she’s selling the Lake Ella shop and her online business. If you’re interested, call John Kraft of Murphy Business Brokers at 222-2001. Fans of Pan-Handlers’ cooking classes, fret not: Chef Bec Kelly will be taking over on Dec. 1, and you can still find all the information you need about upcoming events at the Pan-Handlers Kitchen website. Posted on November 17, 2011 by C.E. In the movie “Mermaids,” Rachel Flax (played by Cher, left) served her daughters hors d’oeuvres for breakfast, lunch and dinner. ∆ The Goodwood Museum and Gardens kicks off a new fall tradition this weekend with its 1st Annual Oyster Roast. Dine on all things oyster, including a raw bar, po’ boys and, of course, roasted oysters, accompanied by muffalettas, Brunswick stew, bread pudding and other dishes. The feast is set for 7-9 p.m. Friday, Nov. 18, at the museum, 1600 Miccosukee Rd. in Midtown. Cost is $30 per person. To RSVP, email ccampbell@goodwoodmuseum.org or call 877-4202 ext. 232. ∆ Tallahassee’s vegan community will host another inaugural autumn event, the 1st Annual Vegan Thanksgiving Potluck. The gathering will be held at 6–9 p.m. Saturday, Nov. 19 at Bread and Roses Food Cooperative, 915-2 Railroad Ave. in All Saints. Bring a vegan dish (no meat, fowl, dairy, eggs, gelatin or honey ingredients) to share and your own plate, cup and utensils. Admission is free. For more information, email veganTLH@yahoo.com or call Jason at (215) 850-9152. ∆ For some of us, hors d’oeuvres make an appetizing start to a meal. Others prefer the hors d’oeuvres to be the meal, a la Cher’s entrée-averse character in “Mermaids.” Whichever way you slice it, you can learn how to up your appetizer game at Pan-Handlers Kitchen’s Hors D’oeuvres class, 6:30-8 p.m. Monday, Nov. 21 at the Pan-Handlers Kitchen cottage, 1635 N. Monroe St. in Lake Ella. Local chef Bec Kelly will teach participants how to make savory shrimp cheesecake bites, bacon-wrapped dates, hummus tapenade and other elegant starters. Cost is $35 per student, with a 10 percent discount if two people sign up together. To register or find out more, visit the Pan-Handlers Kitchen website or email rob@panhandlerskitchen.com.